In recent years, there as been increasing interest in assessing how well these short- and long-term goals have been achieved. What should we expect pre-K to produce for our society? How can we ensure that children who attend these programs get as much out of them as they can? In “Puzzling it out: The current state of scientific knowledge on pre-kindergarten effects” (PDF), a task force comprised of social scientists from Brookings and Duke University lists six consensus statements on what we know about the effects of pre-K and highlights the importance of gathering further evidence to answer three important questions: What features of pre-K programs, specifically, put children on a positive developmental trajectory? What’s the best way to scale up small pre-K programs to a school-district or state-wide level? How can we use evaluations of an earlier generation of programs to guide the development of today’s pre-K programs? The consensus statement is part of a broader report titled “The current state of scientific knowledge on pre-kindergarten effects” (PDF). The Task Force includes Deborah A. Phillips of Georgetown University, Mark W. Lipsey of Vanderbilt University, Kenneth A. Dodge of Duke University, Ron Haskins of the Brookings Institution, Daphna Bassok of the University of Virginia, Margaret R. Burchinal of the University of North Carolina at Chapel Hill, Greg J. Duncan of the University of California-Irvine, Mark Dynarski of the Brookings Institution, Katherine A. Magnuson of the University of Wisconsin-Madison, and Christina Weiland of the University of Michigan. The authors note that the increasing prevalence of pre-K programs provides an ideal laboratory to build upon existing research through additional rigorous analysis of programs over time. 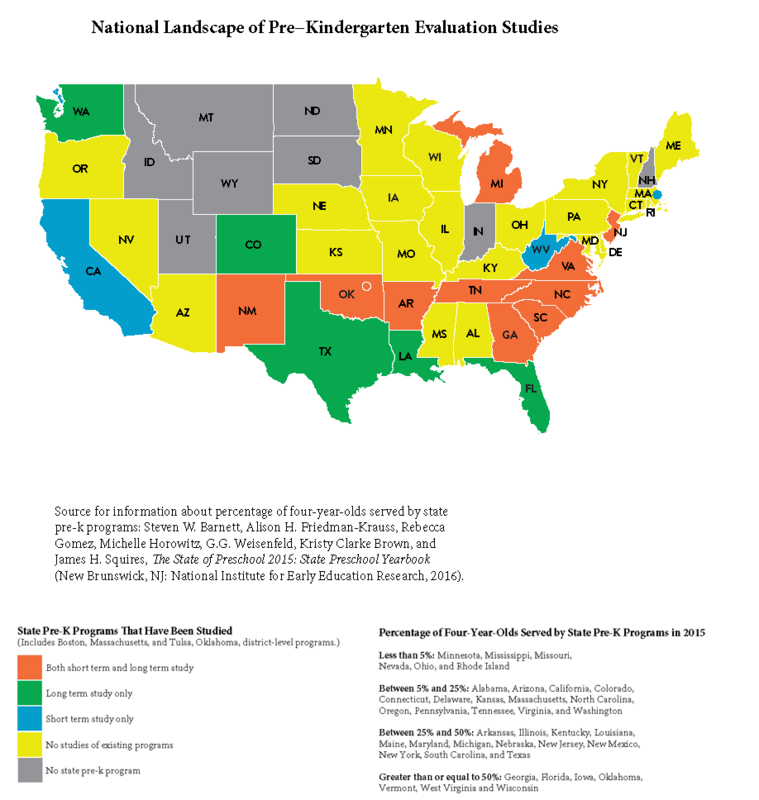 Forty-two states and the District of Columbia, through 57 pre-K programs, have introduced substantial innovations in their early education systems to accommodate pre-K programs that now serve nearly 30 percent of the nation’s 4-year-olds and 5 percent of 3-year-olds.